Dr. Marlene Kanga AM, FTSE Hon. FIEAust, Hon. FIChemE, is President of the World Federation of Engineering Organisations (WFEO), the peak body for engineering institutions internationally representing some 100 engineering institutions and approximately 30 million engineers. Marlene is a chemical engineer, and has significant experienced in in process safety and risk engineering in the oil and gas industry in Australia and New Zealand. She was National President of Engineers Australia in 2013. She is an experienced non-executive director and board member of Sydney Water Corporation Australia’s largest water utility, AirServices Australia providing air navigation services across Australia and the Indian Ocean and other boards involving innovation. She is a director of iOmniscient Pty. Ltd. which has developed artificial intelligence technologies for video. Dr. Kanga is a member of the Australian Academy of Technology Science and Engineering and a Foreign Fellow of the ASEAN Academy of Engineering and Technology. She is an Honorary Fellow of the Institution of Engineers Australia, Honorary Fellow of the Institution of Chemical Engineers (UK). She is a Fellow of Engineering New Zealand, a Fellow of the Institution of Engineers India and a Fellow of the Australian Institute of Company Directors. Dr. Kanga has been listed among the Top 100 Women of Influence in Australia and the Top 100 Engineers in Australia. She was the 2014 FEIAP (Federation of Engineers in Asia and the Pacific) Professional Engineer of the Year, the first woman to win this award. 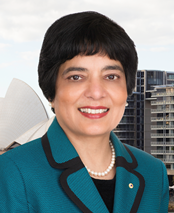 She is a Member of the Order of Australia as recognition of her leadership of the engineering profession. Dr Kanga holds a Bachelor of Technology in Chemical Engineering from the Indian Institute of Technology, Mumbai (IITB – India). She has a Master of Science in Chemical Engineering from Imperial College, the University of London and a PhD in Business Administration from Macquarie University in Sydney.